I was thinking about the books that I have read this year, when I suddenly realised that I had read quite a few Chunksters. 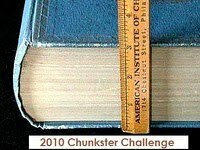 A quick double check confirmed that I had in fact completed the Chunkster Challenge which started on 1 February and is running until 31 January 2011. I had signed up for the Morbookly Obese level, which means I was aiming to read six or more books which meet the definition of a chunkster (being 450 pages or more of ADULT literature (fiction or nonfiction) or 525 pages of large print books. That's a mere 3876 pages right there! Good job! I signed up for this challenge too but like you, I haven't been keeping track along the way as well as I should. yikes! that is a lot of pages. :) i didn't sign up for the challenge--i'm still working on one from summer 2009. i'll finish it one day! I should definitely sign up for that, since I tend toward 400 + pages in my reads...and often more than 450. The books I've written are like that, too. Congratulations, Marg! I'm very impressed...Especially given my own (ahem!) reputation for not completing chunksters. I think 2010 is my year to buckle down and read a few...I've been accepting less and less ARCs so I think the time is now! PS. Received Here Be Dragons in the mail the other day from my friend who works at the agency that reps SKP. It will be the next chunkster I read after TSIS. Congrats on finishing your challenge. This year I seem to really be avoiding chunksters! Although I didn't realize the Larsson book was one and I'm definitely planning to read that one as soon as it arrives on the shelves over here in the States! Congrats on completing the challenge so quickly! I signed up for Mor-book-ly Obese too and have been surprised at how close I am to reaching that target so early in the year aswell. Woo-hoo! congrats! That is a great accomplishment.